I have but one passion: to enlighten those who have been kept in the dark, in the name of humanity which has suffered so much and is entitled to happiness. My fiery protest is simply the cry of my very soul. Émile Édouard Charles Antoine Zola (2 April 1840 – 29 September 1902) was a French novelist, playwright, journalist, the best-known practitioner of the literary school of naturalism, and an important contributor to the development of theatrical naturalism. I don't care for the great centuries. All I care about is life, struggle, intensity. I am at ease in my generation. I have for me only an ideal of truth and justice. But I am quite calm; I shall conquer. I was determined that my country should not remain the victim of lies and injustice. I may be condemned here. The day will come when France will thank me for having helped to save her honor. Letter to Paul Cézanne (16 April 1860), as published in Paul Cézanne : Letters (1995) edited by John Rewald. I am little concerned with beauty or perfection. I don't care for the great centuries. All I care about is life, struggle, intensity. I am at ease in my generation. Existence is so bitter for every one of us! Ought we not forgive others much, my friend, if we wish to be forgiven ourselves? Le Figaro (1881) as quoted in The Oxford Dictionary of Quotations (1999) by Elizabeth Knowles and Angela Partington, p. 840. Everything is only a dream. Le Rêve [The Dream] (1888). Paris flared — Paris, which the divine sun had sown with light, and where in glory waved the great future harvest of Truth and of Justice. Paris (1898) Last of Les Trois Villes [The Three Cities] trilogy. Dreyfus is innocent. I swear it! I stake my life on it — my honor! At this solemn moment, in the presence of this tribunal which is the representative of human justice, before you, gentlemen of the jury, who are the very incarnation of the country, before the whole of France, before the whole world, I swear that Dreyfus is innocent. By my forty years of work, by the authority that this toil may have given me, I swear that Dreyfus is innocent. By all I have now, by the name I have made for myself, by my works which have helped for the expansion of French literature, I swear that Dreyfus is innocent. May all that melt away, may my works perish if Dreyfus be not innocent! He is innocent. All seems against me — the two Chambers, the civil authority, the military authority, the most widely-circulated journals, the public opinion which they have poisoned. And I have for me only an ideal of truth and justice. But I am quite calm; I shall conquer. I was determined that my country should not remain the victim of lies and injustice. I may be condemned here. The day will come when France will thank me for having helped to save her honor. Appeal for Dreyfus delivered at his trial for libel (22 February 1898). As quoted in Dreyfus : His Life and Letters‎ (1937) edited by Pierre Dreyfus, p. 175. As quoted in Writers on Writing‎ (1986) by Jon Winokur. As quoted in Wisdom for the Soul : Five Millennia of Prescriptions for Spiritual Healing‎ (2006) by Larry Chang , p. 55. Ne me regardez plus comme ça, parce que vous allez vous user les yeux. Translation: Don't go on staring at me like that, because you'll wear your eyes out. La Bête Humaine, Ch. 5, (1890). My duty is to speak out; I do not wish to be an accomplice in this travesty. My nights would otherwise be haunted by the spectre of the innocent man, far away, suffering the most horrible of tortures for a crime he did not commit. The people clamored for the traitor to be publicly stripped of his rank and demanded to see him writhing with remorse on his rock of infamy. Lt. Colonel Picquart who, alone, had done his duty, was to become the victim, the one who got ridiculed and punished. The honor of a man whose life is spotless is being vilely attacked: A society that sinks to that level has fallen into decay. The first court martial was perhaps unintelligent; the second one is inescapably criminal. Truth is on the march, and nothing will stop it. The action I am taking is no more than a radical measure to hasten the explosion of truth and justice. Would you allow me, grateful as I am for the kind reception you once extended to me, to show my concern about maintaining your well-deserved prestige and to point out that your star which, until now, has shone so brightly, risks being dimmed by the most shameful and indelible of stains? A court martial, under orders, has just dared to acquit a certain Esterhazy, a supreme insult to all truth and justice. And now the image of France is sullied by this filth, and history shall record that it was under your presidency that this crime against society was committed. As they have dared, so shall I dare. Dare to tell the truth, as I have pledged to tell it, in full, since the normal channels of justice have failed to do so. My duty is to speak out; I do not wish to be an accomplice in this travesty. My nights would otherwise be haunted by the spectre of the innocent man, far away, suffering the most horrible of tortures for a crime he did not commit. The truth, first of all, about Dreyfus' trial and conviction: At the root of it all is one evil man, Lt. Colonel du Paty de Clam, who was at the time a mere Major. He is the entire Dreyfus case, and the entirety of it will only come to light when an honest enquiry firmly establishes his actions and responsibilities. ... Nobody would ever believe the experiments to which he subjected the unfortunate Dreyfus, the traps he set for him, the wild investigations, the monstrous fantasies, the whole demented torture. Ah, that first trial! What a nightmare it is for all who know it in its true details. Major du Paty de Clam had Dreyfus arrested and placed in solitary confinement. He ran to Mme Dreyfus, terrorised her, telling her that, if she talked, that was it for her husband. Meanwhile, the unfortunate Dreyfus was tearing his hair out and proclaiming his innocence. I would like to point out how this travesty was made possible, how it sprang out of the machinations of Major du Paty de Clam, how Generals Mercier, de Boisdeffre and Gonse became so ensnared in this falsehood that they would later feel compelled to impose it as holy and indisputable truth. Having set it all in motion merely by carelessness and lack of intelligence, they seem at worst to have given in to the religious bias of their milieu and the prejudices of their class. In the end, they allowed stupidity to prevail. The public was astounded; rumors flew of the most horrible acts, the most monstrous deceptions, lies that were an affront to our history. The public, naturally, was taken in. No punishment could be too harsh. The people clamored for the traitor to be publicly stripped of his rank and demanded to see him writhing with remorse on his rock of infamy. Could these things be true, these unspeakable acts, these deeds so dangerous that they must be carefully hidden behind closed doors to keep Europe from going up in flames? No! They were nothing but the demented fabrications of Major du Paty de Clam, a cover-up of the most preposterous fantasies imaginable. To be convinced of this one need only read carefully the accusation as it was presented before the court martial. How flimsy it is! The fact that someone could have been convicted on this charge is the ultimate iniquity. I defy decent men to read it without a stir of indignation in their hearts and a cry of revulsion, at the thought of the undeserved punishment being meted out there on Devil's Island. He knew several languages: a crime! He carried no compromising papers: a crime! He would occasionally visit his country of origin: a crime! He was hard-working, and strove to be well informed: a crime! He did not become confused: a crime! He became confused: a crime! And how childish the language is, how groundless the accusation! It is said that within the council chamber the judges were naturally leaning toward acquittal. It becomes clear why, at that point, as justification for the verdict, it became vitally important to turn up some damning evidence, a secret document that, like God, could not be shown, but which explained everything, and was invisible, unknowable, and incontrovertible. I deny the existence of that document.... a document concerning national defense that could not be produced without sparking an immediate declaration of war tomorrow? No! No! It is a lie, all the more odious and cynical in that its perpetrators are getting off free without even admitting it. They stirred up all of France, they hid behind the understandable commotion they had set off, they sealed their lips while troubling our hearts and perverting our spirit. I know of no greater crime against the state. And now we come to the Esterhazy case. Three years have passed, many consciences remain profoundly troubled, become anxious, investigate, and wind up convinced that Dreyfus is innocent. 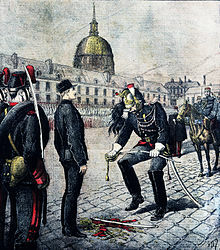 Feelings were running high, for the conviction of Esterhazy would inevitably lead to a retrial of Dreyfus, an eventuality that the General Staff wanted at all cost to avoid. This must have led to a brief moment of psychological anguish. Note that, so far, General Billot was in no way compromised. Newly appointed to his position, he had the authority to bring out the truth. He did not dare, no doubt in terror of public opinion, certainly for fear of implicating the whole General Staff, General de Boisdeffre, and General Gonse, not to mention the subordinates. So he hesitated for a brief moment of struggle between his conscience and what he believed to be the interest of the military. Once that moment passed, it was already too late. He had committed himself and he was compromised. From that point on, his responsibility only grew, he took on the crimes of others, he became as guilty as they, if not more so, for he was in a position to bring about justice and did nothing. Can you understand this: for the last year General Billot, Generals Gonse and de Boisdeffre have known that Dreyfus is innocent, and they have kept this terrible knowledge to themselves? Lt. Colonel Picquart had carried out his duty as an honest man. He kept insisting to his superiors in the name of justice. He even begged them, telling them how impolitic it was to temporize in the face of the terrible storm that was brewing and that would break when the truth became known. Meanwhile, in Paris, truth was marching on, inevitably, and we know how the long-awaited storm broke. Mr. Mathieu Dreyfus denounced Major Esterhazy as the real author of the bordereau just as Mr. Scheurer-Kestne was handing over to the Minister of Justice a request for the revision of the trial. This is where Major Esterhazy comes in. Witnesses say that he was at first in a panic, on the verge of suicide or running away. Then all of a sudden, emboldened, he amazed Paris by the violence of his attitude. It came down, once again, to the General Staff protecting itself, not wanting to admit its crime, an abomination that has been growing by the minute. In disbelief, people wondered who Commander Esterhazy's protectors were. First of all, behind the scenes, Lt. Colonel du Paty de Clam was the one who had concocted the whole story, who kept it going, tipping his hand with his outrageous methods. Next General de Boisdeffre, then General Gonse, and finally, General Billot himself were all pulled into the effort to get the Major acquitted, for acknowledging Dreyfus's innocence would make the War Office collapse under the weight of public contempt. And the astounding outcome of this appalling situation was that the one decent man involved, Lt. Colonel Picquart who, alone, had done his duty, was to become the victim, the one who got ridiculed and punished. O justice, what horrible despair grips our hearts? It was even claimed that he himself was the forger, that he had fabricated the letter-telegram in order to destroy Esterhazy . But, good God, why? To what end? Find me a motive. Was he, too, being paid off by the Jews? The best part of it is that Picquart was himself an anti-Semite. Yes! We have before us the ignoble spectacle of men who are sunken in debts and crimes being hailed as innocent, whereas the honor of a man whose life is spotless is being vilely attacked: A society that sinks to that level has fallen into decay. The Esterhazy affair, thus, Mr. President, comes down to this: a guilty man is being passed off as innocent. For almost two months we have been following this nasty business hour by hour. I am being brief, for this is but the abridged version of a story whose sordid pages will some day be written out in full. How could anyone expect a court martial to undo what another court martial had done? I am not even talking about the way the judges were hand-picked. Doesn't the overriding idea of discipline, which is the lifeblood of these soldiers, itself undercut their capacity for fairness? Discipline means obedience. When the Minister of War, the commander in chief, proclaims, in public and to the acclamation of the nation's representatives, the absolute authority of a previous verdict, how can you expect a court martial to rule against him? General Billot directed the judges in his preliminary remarks, and they proceeded to judgment as they would to battle, unquestioningly. The preconceived opinion they brought to the bench was obviously the following: “Dreyfus was found guilty for the crime of treason by a court martial; he therefore is guilty and we, a court martial, cannot declare him innocent. On the other hand, we know that acknowledging Esterhazy's guilt would be tantamount to proclaiming Dreyfus innocent.” There was no way for them to escape this rationale. So they rendered an iniquitous verdict that will forever weigh upon our courts martial and will henceforth cast a shadow of suspicion on all their decrees. The first court martial was perhaps unintelligent; the second one is inescapably criminal. We are told of the honor of the army; we are supposed to love and respect it. Ah, yes, of course, an army that would rise to the first threat, that would defend French soil, that army is the nation itself, and for that army we have nothing but devotion and respect. But this is not about that army, whose dignity we are seeking, in our cry for justice. What is at stake is the sword, the master that will one day, perhaps, be forced upon us. Bow and scrape before that sword, that god? No! Ah, what a cesspool of folly and foolishness, what preposterous fantasies, what corrupt police tactics, what inquisitorial, tyrannical practices! What petty whims of a few higher-ups trampling the nation under their boots, ramming back down their throats the people's cries for truth and justice, with the travesty of state security as a pretext. It is a crime that those people who wish to see a generous France take her place as leader of all the free and just nations are being accused of fomenting turmoil in the country, denounced by the very plotters who are conniving so shamelessly to foist this miscarriage of justice on the entire world. It is a crime to lie to the public, to twist public opinion to insane lengths in the service of the vilest death-dealing machinations. It is a crime to poison the minds of the meek and the humble, to stoke the passions of reactionism and intolerance, by appealing to that odious anti-Semitism that, unchecked, will destroy the freedom-loving France of the Rights of Man. It is a crime to exploit patriotism in the service of hatred, and it is, finally, a crime to ensconce the sword as the modern god, whereas all science is toiling to achieve the coming era of truth and justice. Truth and justice, so ardently longed for! How terrible it is to see them trampled, unrecognized and ignored! These military tribunals have, decidedly, a most singular idea of justice. This is the plain truth, Mr. President, and it is terrifying. It will leave an indelible stain on your presidency. I realise that you have no power over this case, that you are limited by the Constitution and your entourage. You have, nonetheless, your duty as a man, which you will recognise and fulfill. As for myself, I have not despaired in the least, of the triumph of right. I repeat with the most vehement conviction: truth is on the march, and nothing will stop it. Today is only the beginning, for it is only today that the positions have become clear: on one side, those who are guilty, who do not want the light to shine forth, on the other, those who seek justice and who will give their lives to attain it. I said it before and I repeat it now: when truth is buried underground, it grows and it builds up so much force that the day it explodes it blasts everything with it. We shall see whether we have been setting ourselves up for the most resounding of disasters, yet to come. But this letter is long, Sir, and it is time to conclude it. I accuse Lt. Col. du Paty de Clam of being the diabolical creator of this miscarriage of justice — unwittingly, I would like to believe — and of defending this sorry deed, over the last three years, by all manner of ludricrous and evil machinations. I accuse General Mercier of complicity, at least by mental weakness, in one of the greatest inequities of the century. I accuse General Billot of having held in his hands absolute proof of Dreyfus’s innocence and covering it up, and making himself guilty of this crime against mankind and justice, as a political expedient and a way for the compromised General Staff to save face. I accuse Gen. de Boisdeffre and Gen. Gonse of complicity in the same crime, the former, no doubt, out of religious prejudice, the latter perhaps out of that esprit de corps that has transformed the War Office into an unassailable holy ark. I accuse Gen. de Pellieux and Major Ravary of conducting a villainous enquiry, by which I mean a monstrously biased one, as attested by the latter in a report that is an imperishable monument to naïve impudence. I accuse the three handwriting experts, Messrs. Belhomme, Varinard and Couard, of submitting reports that were deceitful and fraudulent, unless a medical examination finds them to be suffering from a condition that impairs their eyesight and judgement. I accuse the War Office of using the press, particularly L’Eclair and L’Echo de Paris, to conduct an abominable campaign to mislead the general public and cover up their own wrongdoing. Finally, I accuse the first court martial of violating the law by convicting the accused on the basis of a document that was kept secret, and I accuse the second court martial of covering up this illegality, on orders, thus committing the judicial crime of knowingly acquitting a guilty man. In making these accusations I am aware that I am making myself liable to articles 30 and 31 of the law of 29/7/1881 regarding the press, which make libel a punishable offence. I expose myself to that risk voluntarily. As for the people I am accusing, I do not know them, I have never seen them, and I bear them neither ill will nor hatred. To me they are mere entities, agents of harm to society. The action I am taking is no more than a radical measure to hasten the explosion of truth and justice. I have but one passion: to enlighten those who have been kept in the dark, in the name of humanity which has suffered so much and is entitled to happiness. My fiery protest is simply the cry of my very soul. Let them dare, then, to bring me before a court of law and let the enquiry take place in broad daylight! I am waiting. Civilization will not attain perfection until the last stone from the last church falls on the last priest. Cited as attributed to Zola in The Heretic's Handbook of Quotations : Cutting Comments on Burning Issues (1992) by Charles Bufe, p. 183, but no earlier citation has yet been located, and this appears to be very similar to remarks often attributed to Denis Diderot: "Men will never be free until the last king is strangled with the entrails of the last priest" and "Let us strangle the last king with the guts of the last priest" — these are loosely derived from a statement Diderot actually did make: "his hands would plait the priest's entrails, for want of a rope, to strangle kings." This quote appeared in soviet popular-scientific work "Satellite atheist" (Sputnik ateista) (1959), p. 491. Paul Cézanne, letter to Emile Zola (ca 1861) as quoted by Ambroise Vollard, Cézanne, (1984) Dover publications Inc. New York p. 23 [a republication of Paul Cézanne: His Life and Art (1937) a translation by Harold L. Van Doren of Paul Cézanne (1914) ed., Ambroise Vollard]. This quote refers to an early Paris portrait of his friend Zola. You can’t ask a man to talk sensibly about the art of painting if he simply doesn't know anything about it. 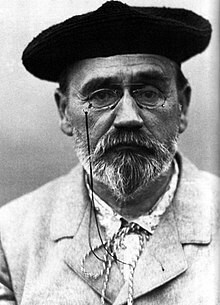 But by God, how can he [Émile Zola who was his youth friend in Aix-de-Provence and who had used Cezanne's life as model of a disturbed artist in his novel L’Oeuvre] dare to say that a painter is done because he has painted one bad picture? When a picture isn't realized, you pitch it in the fire and start another one. Paul Cézanne (1902) after Zola's death in a conversation in Cezanne’s studio in Aix, as quoted by Ambroise Vollard, Cézanne, (1984) Dover publications Inc. New York, p. 74 [a republication of Paul Cézanne: His Life and Art (1937) a translation by Harold L. Van Doren of Paul Cézanne (1914) ed., Ambroise Vollard]. He was a moment in the conscience of Man. Anatole France (5 October 1902) Speech at Zola's funeral. His work is evil, and he is one of those unhappy beings of whom one can say that it would be better had he never been born. I will not, certainly, deny his detestable fame. No one before him has raised so lofty a pile of ordure. That is his monument, and its greatness cannot be disputed. Anatole France, On Life and Letters (1911). Then came the sweetly hypocritical compliments, the questions which are traps, the declarations which, if you follow him, he will suddenly interrupt with an 'Oh, my dear fellow, I wouldn't go as far as you!' followed by a virtual recantation of his previous arguments. In fact that art of talking without saying anything of which the Man of Medan is the master. Edmond de Goncourt, Pages from the Goncourt Journal(1962) Tr. R. Baldick. Adolphe Thiers... was named "chief of the executive power of the French Republic" and given the authority to negotiate the terms of surrender with Otto von Bismarck. ...Since escaping to Marseilles in September  Zola had launched a newspaper, La Marseillaise... intended... as a voice of the proletariat. However, this organ ceased publication... when, ironically, the printers struck for higher wages [and] Zola, turning strike-buster, tried unsuccessfully to overcome by engaging a team of cut-rate printers from Arles. With his career as a newspaper proprietor thwarted, he began cultivating plans to secure... a [political] post... [e]ventually... secretary to an elderly and reputedly senile left-wing deputy in the National Assembly. He was also reporting on the National Assembly for La Cloche and fretting about the refugees occupying his apartment in Paris. "Has anything been ransacked or stolen?" Ross King, The Judgment of Paris: The Revolutionary Decade That Gave the World Impressionism (2006) p. 298; citing Frederick Brown, Zola, A Life (1996) p. 208. In 1886 he published... L'Oeuvre, the hero of which was a painter. ...Zola's own notes are evidence that the portrait... was based partly on Manet and partly on Cézanne... [T]he hero, symbolizing an impressionist, is characterized as a painful mixture of genius and madness. The struggle between his great dreams and his insufficient creative power ends in utter failure, in suicide. ...Cézanne was deeply hurt ...[and] found there a moving echo of his own youth, which had been inseparable from that of Zola, but also the betrayal of his hopes. ...[H]e now saw irrevocably expressed in this novel: Zola's pity for those who had not achieved success, a pity more unbearable than contempt. Zola had not only failed to grasp the true meaning of the effort to which Cézanne and his comrades had devoted all their strength, he had lost all feeling of solidarity. From the secure castle he had built himself in Médan, he passed judgement upon his friends, embracing all the bourgeois prejudices against which they had once fought together. The letter which Cézanne wrote to Zola to thank him for sending a copy of L'Oeuvre was meloncholy and sad; it was... a letter of farewell, and the two friends were never to meet again. John Rewald, History of Impressionism (1946) p. 398; citing Cézanne's (April 4, 1886) letter to Zola; Cézanne Letters, London, 1941, p. 183. The Times, London (1898) article on Zola's libel trial, as quoted by John A. Corry, : Prelude to a Century (1998) p. 72. Last month marked the centennial anniversary of the greatest newspaper article of all time... Written in the form of an open letter to the President of France, the 4,000 word article, entitled "J'Accuse!" (I Accuse! ), rightly has been judged a "masterpiece" of polemics and a literary achievement "of imperishable beauty." No other newspaper article has ever provoked such public debate and controversy or had such an impact on law, justice, and society. Donald E. Wilkes Jr., professor at the University of Georgia School of Law, J'accuse...! Emile, Zola, Alfred Dreyfus, and the Greatest Newspaper Article in History in Flagpole Magazine (11 February 1998).